You've finally managed to pick up your very own iPad 2. Now let the editors at Macworld help you learn everything you need to know about it with our iPad 2 Superguide, available as a PDF, on CD, and on Apple's iBookstore. The book has something for everyone, whether you're brand-new to the iPad or old hand. This in-depth Superguide covers everything you need know about your iPad's hardware and software, including the latest on iOS 4.3. We also highlight and recommend some great apps and accessories to get you started. In this 181-page book, we provide step-by-step instructions for getting acquainted with your iPad 2. Familiarize yourself with every port, button, and switch on your device with a labeled diagram and descriptions of each. Customize your settings by setting parental controls, changing the behavior of your iPad’s side-switch, and creating a data plan (3G-enabled iPads only). Learn about the many multitouch gestures you’ll be using to open, close, zoom, and swipe on the 9.7-inch LED-backlit screen. Communicate with others using Mail, Safari, and FaceTime. In addition, we'll show you how to sync and load all your favorite music, movies, television shows, podcasts, apps, and files using iTunes; how to convert any file to work on the iPad; and how to stream your media to a television or other source using AirPlay. Organize your life using the iPad's built-in Calendar, Notes, and Contacts apps, and get the best recommendations for third-party apps to help increase productivity. Discover how to get work done on the iPad using iWork, Google Docs, and Microsoft Office files. Even without a tech support background, it's easy to troubleshoot most simple problems on the iPad. In our Troubleshooting Tips chapter, we give a run-down of common questions plaguing users and the easiest ways to fix them. We'll also share some simple tricks to keep your device up and running, and suggestions for when you need to consult with the experts. 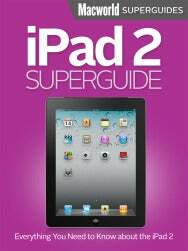 The iPad 2 Superguide comes in three convenient formats—just choose the one that works best for you. If you'd rather bypass your Mac altogether, you can buy the Superguide directly on your iPhone, iPod touch, or iPad from Apple's iBookstore for $9.99. Finally, if you'd like to give the PDF version of this book as a gift, you can have it mailed to you on a CD-ROM for $12.95. Not convinced? If you want to see more before you commit, we've created a 28-page sample PDF that includes the book's complete table of contents and selected pages. Be sure to check out the other books in our popular Superguide series: Digital Photography, iPhone and iPod Touch, Mac Troubleshooting, Switching to the Mac, and Mac Basics. And don't miss out on our iBookstore-exclusive title, 100 Things Every Mac User Should Know.